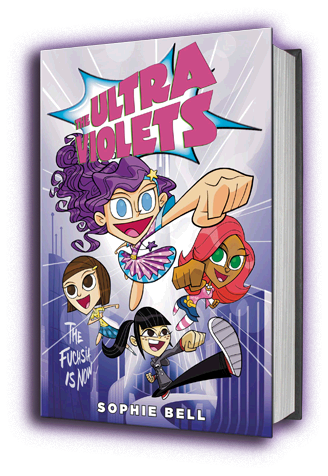 The Ultra Violets by Sophie Bell is such a fun, cute, and girl empowered book! Reminiscent of the Powerpuff Girls, it highlights the importance of friendship, self-confidence, education, family, and protecting the weak. Such a great book to read with the tween in your life, and one that girls can share amongst themselves. I guarantee that you'll see fearsome foursomes running around pretending to be Iris, Cheri, Scarlet, or Opaline. And to have even more fun, you should check out the companion website, The Ultra Violets, and play the really cute game Glitter Rush! To celebrate this awesome book, Penguin was kind enough to offer a copy to give away to one lucky reader! Happy reading! The winner will have 48 hours to respond before a new winner is chosen. As the prize is being sent by the publishers, I cannot guarantee the arrival of the book. Superpowers...I would want to manipulate objects with my mind. That, and never have to sleep again. It's so inconvenient to have to sleep for 1/3 of my day.